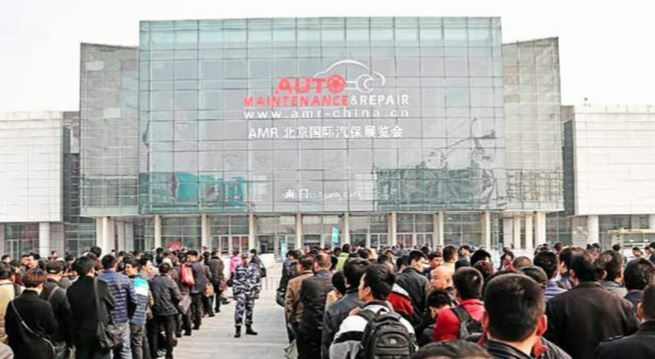 The 2015 staging of AMR (Auto Maintenance and Repair) exhibition took place in Beijing from 9-12 April, and was based at the New China International Exhibition Centre near the city's Capital International Airport. Event sponsors included the China Auto Maintenance Equipment Industry Association (CAMEIA); the China Automotive Maintenance and Repair Trade Association (CAMRTA); and the Beijing Traders-Link International Exhibition Co., Ltd.
AutoForum was fortunate enough to attend the event once again and together with our sister publication BodyShop News, enjoyed a wealth of automotive technologies, supplies and equipment. This year, the show celebrated its 32nd event and promised a bigger and better show - that is what it delivered. With a show area of over 100,000 square meters and 1150 exhibitors, it is the biggest such event in Asia. 2015 saw over 53000 visitors walk the halls, an increase of 9% on the 2014 show. Exhibition areas cover all aspects of the sector, including: Repair Equipment,Tyre Repair Equipment, Tyre Repair Products, Testing And Diagnostic Machine, Coating Car Care, Tools, Machine Tool, Teaching Aids , Purification Systems, Environmental Protection And Energy-Saving, Electronic Apparatus, Car Safety, Car Service Chain Stores and many more. Notably, the event attracted more traditionally European and American buyers, and the major Russian distributors put in an appearance. That is despite a decline in the Rouble. The show plays host not only to the exhibitors from around the globe but also offers visitors several forums and seminars over the course of the event. In addition, the event honours the top products and exhibitors from the previous year in an awards ceremony. Honours included Top 20 AMR products, Top 20 Repair Tools, AMR2015 Recommended Products, China Green Repair Innovation Products and 2015 China Top 10 Auto Maintenance and Repair Products. Overall it was clear that visitors are spoiled for choice at AMR, and facilities provided by the organisers make for an efficient visit, such as 24 hour free internet access, visitor badge pre-delivery, 3D photo printing, VIP lounge, souvenirs and much more. If you missed the 2015 event – make sure you get to AMR 2016!